Identify alkanes, alkenes, alkynes, and aromatic compounds. List some properties of hydrocarbons. The simplest organic compounds are those composed of only two elements: carbon and hydrogen. These compounds are called hydrocarbons. Hydrocarbons themselves are separated into two types: aliphatic hydrocarbons and aromatic hydrocarbons. Aliphatic hydrocarbons are hydrocarbons based on chains of C atoms. There are three types of aliphatic hydrocarbons. Alkanes are aliphatic hydrocarbons with only single covalent bonds. Alkenes are aliphatic hydrocarbons that contain at least one C–C double bond, and alkynes are aliphatic hydrocarbons that contain a C–C triple bond. 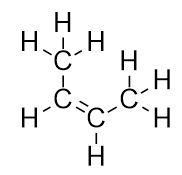 Occasionally, we find an aliphatic hydrocarbon with a ring of C atoms; these hydrocarbons are called cycloalkanes (or cycloalkenes or cycloalkynes). Aromatic hydrocarbons, such as benzene,are flat-ring systems that contain continuously overlapping p orbitals.Electrons in the benzene ring have special energetic properties that give benzene physical and chemical properties that are markedly different from alkanes. Originally, the term aromatic was used to describe this class of compounds because they were particularly fragrant. However, in modern chemistry the term aromatic denotes the presence of a very stable ring that imparts different and unique properties to a molecule. 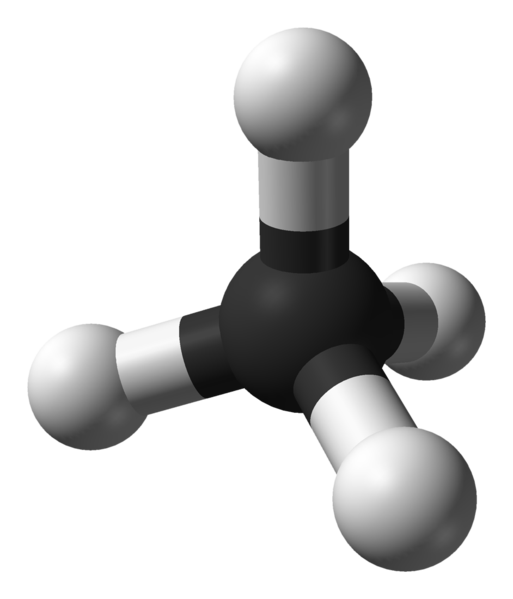 The methane molecule is three-dimensional, with the H atoms in the positions of the four corners of a tetrahedron. Source: “Methane-CRC-MW-3D-balls” by Ben Mills is in the public domain. The diagrams we have seen so far representing alkanes are fairly simiple Lewis structures. However, as molecules get larger, the Lewis structures become more and more complex. One way around this is to use a condensed structure,which lists the formula of each C atom in the backbone of the molecule. 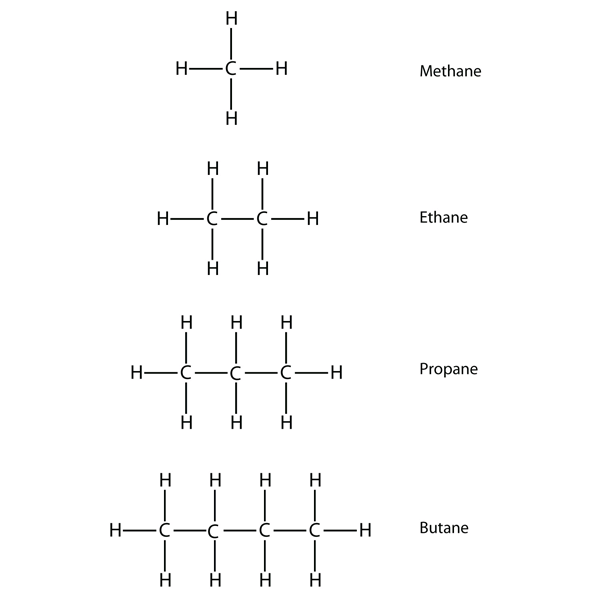 For example, the condensed structure for ethane is CH3CH3, while it is CH3CH2CH3 for propane. Table 16.1 “The First 10 Alkanes” gives the molecular formulas, the condensed structural formulas, and the names of the first 10 alkanes. Because alkanes have the maximum number of H atoms possible according to the rules of covalent bonds, alkanes are also referred to as saturated hydrocarbons. What do you notice about the names of alkanes and alkenes? The names of alkenes are the same as their corresponding alkanes except that the suffix (ending) is –ene, rather than –ane. Using a stem known as the parent chain to indicate the number of C atoms in a molecule and an ending to represent the type of organic compound is common in organic chemistry, as we shall see. (A double bond between the third and fourth C atoms is the same as having it between the first and second C atoms, only flipped over.) The rules of naming in organic chemistry require that these two substances have different names. The first molecule is named but-1-ene, while the second molecule is named but-2-ene. The number between the parent-chain name and suffix is known as a locant, and indicates on which carbon the double bond originates. The lowest possible number is used to number a feature in a molecule; hence, calling the second molecule but-3-ene would be incorrect. Numbers are common parts of organic chemical names because they indicate which C atom in a chain contains a distinguishing feature. When the double bond (or other functional group) is located on the first carbon, it is common practice for some authors to leave out the locant. For example, if butene were written without a locant, you should assume it refers to but-1-ene, not but-2-ene. The compounds but-1-ene and but-2-ene have different physical and chemical properties, even though they have the same molecular formula—C4H8. Different molecules with the same molecular formula are called isomers. Isomers are common in organic chemistry and contribute to its complexity. Based on the names for the butene molecules, propose a name for this molecule. With five C atoms, we will use the pent– parent name, and with a C–C double bond, this is an alkene, so this molecule is a pentene. In numbering the C atoms, we use the number 2 because it is the lower possible label. So this molecule is named pent-2-ene. The alternating single and double C–C bonds give the benzene ring a special stability, and it does not react like an alkene as might be expected. As fundamental as hydrocarbons are to organic chemistry, their properties and chemical reactions are rather mundane. Most hydrocarbons are nonpolar because of the close electronegativities of C and H atoms. As such, they dissolve only sparingly in H2O and other polar solvents. Small hydrocarbons, such as methane and ethane, are gases at room temperature, while larger hydrocarbons, such as hexane and octane, are liquids. Even larger hydrocarbons, like hentriacontane (C31H64), are solids at room temperature and have a soft, waxy consistency. The reaction conditions are usually mild; in many cases, the halogen reacts spontaneously with an alkene or an alkyne. The combustion of hydrocarbons is a primary source of energy in our society. 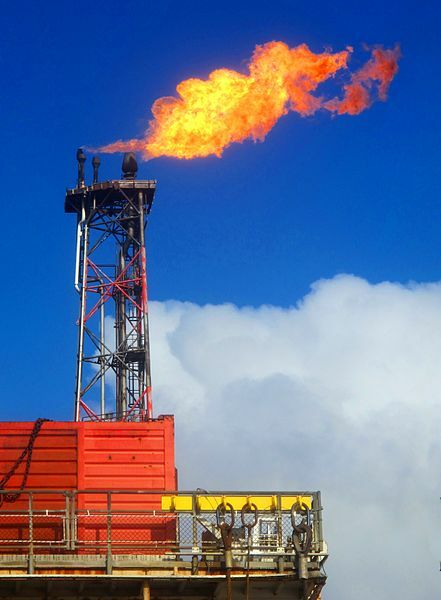 First gas from the Oselvar module on the Ula platform in Norway on April 14, 2012, by Varodrig under a CC BY SA license. The simplest organic compounds are hydrocarbons, which are composed of carbon and hydrogen. Hydrocarbons can be aliphatic or aromatic; aliphatic hydrocarbons are divided into alkanes, alkenes, and alkynes. The combustion of hydrocarbons is a primary source of energy for our society. Define hydrocarbon. What are the two general types of hydrocarbons? What are the three different types of aliphatic hydrocarbons? How are they defined? Indicate whether each molecule is an aliphatic or an aromatic hydrocarbon. If it is aliphatic, identify the molecule as an alkane, an alkene, or an alkyne. 4. Indicate whether each molecule is an aliphatic or an aromatic hydrocarbon. If it is aliphatic, identify the molecule as an alkane, an alkene, or an alkyne. 5. Indicate whether each molecule is an aliphatic or an aromatic hydrocarbon. If it is aliphatic, identify the molecule as an alkane, an alkene, or an alkyne. 6. Indicate whether each molecule is an aliphatic or an aromatic hydrocarbon. If it is aliphatic, identify the molecule as an alkane, an alkene, or an alkyne. 7. Name and draw the structural formulas for the four smallest alkanes. 8. Name and draw the structural formulas for the four smallest alkenes. 9. What does the term aromatic imply about an organic molecule? 10. What does the term normal imply when used for alkanes? 11. Explain why you may see prop-1-ene written just as propene. 12. Explain why the name but-3-ene is incorrect. What is the proper name for this molecule? 13. Name and draw the structural formula of each isomer of pentene. 14. Name and draw the structural formula of each isomer of hexyne. 15. Write a chemical equation for the reaction between methane and bromine. 16. Write a chemical equation for the reaction between ethane and chlorine. 17. Draw the structure of the product of the reaction of bromine with propene. 18. Draw the structure of the product of the reaction of chlorine with but-2-ene. 19. Draw the structure of the product of the reaction of hydrogen with but-1-ene. 20. Draw the structure of the product of the reaction of hydrogen with pent-2-ene. 21. Write the balanced chemical equation for the combustion of heptane. 22. Write the balanced chemical equation for the combustion of nonane. 9. 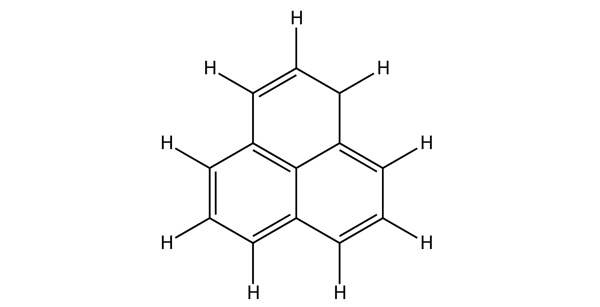 Aromatic means the molecule has a flat ring system with continuous p orbitals (e.g., benzene). 11. The 1 is not necessary since the double bond is on the first carbon. Hydrocarbons by David W. Ball and Jessie A. Key is licensed under a Creative Commons Attribution-NonCommercial-ShareAlike 4.0 International License, except where otherwise noted.